I am new to SharePoint, so please hang in there with me as I try to muddle through this. I have a calendar that I would like to add a link to click on to add a new event to in the calendar view so that the users do not have to click on Events> New Event. When you are looking at a calendar styled view and mouse over any given day there should be a little link that says "add" that appears on that day. 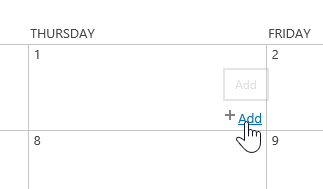 Clicking it will open the form for you to add an item to the calendar with related day you selected. I figured this out. Here is how I did it. Grab the url from the "New Event" form to use for url link. Not the answer you're looking for? Browse other questions tagged sharepoint-calendar newform or ask your own question. How to add a registration button to a calendar list / list form? Is There A Way to Maintain/Keep Calendar Event History?